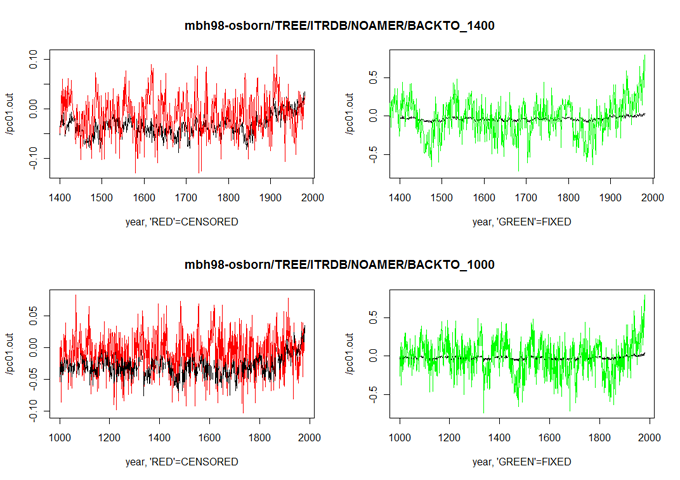 "Sheep Mountain CA (ca534) exhibits the distinct “hockey stick” shape of the final MBH98 Northern Hemisphere temperature index, while another NOAMER site, Mayberry Slough AR (ar052), has a growth peak in the early 19th century (Figure 1). The MBH98 algorithm assigns 390 times the weight to Sheep Mountain compared to Mayberry Slough ... "
"MM-type results ... occur ... if the bristlecone pine sites are excluded, while MBH-type results occur if bristlecone pine sites ... are included. Mann’s FTP site actually contains a sensitivity study [/BACKTO_1400-CENSORED/] on the effect of excluding 20 bristlecone pine sites in which this adverse finding was discovered, but the results were not reported or stated publicly and could be discerned within the FTP site only with persistent detective work." "Around 1990, NOAA/NCDC's GHCN dataset lost more than three-quarters of the climate measuring stations around the world. It can be shown that country by country, they lost stations with a bias towards higher-latitude, higher-altitude and rural locations, all of which had a tendency to be cooler. The remaining climate monitoring stations were increasingly near the sea, at lower elevations, and at airports near larger cities. 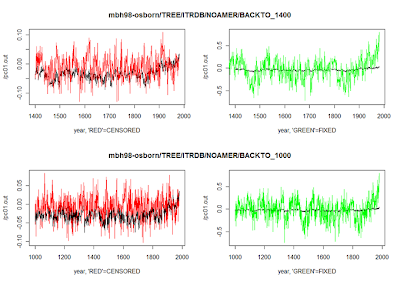 This data were then used to determine the global average temperature and to initialize climate models. Interestingly, the very same often colder stations that have been deleted from the world climate network were retained for computing the average-temperature in the base periods, further increasing the potential bias towards overstatement of the warming."